This article is about the WWI Nieuport 11 fighter. For the pre-WWI Nieuport II racer, see Nieuport II. The Nieuport 11, nicknamed the Bébé, was a French World War I single seat sesquiplane fighter aircraft, designed by Gustave Delage. It was the primary aircraft that ended the Fokker Scourge in 1916. The type saw service with several of France's allies, and gave rise to the series of "vee-strut" Nieuport fighters that remained in service (latterly as trainers) into the 1920s. The Nieuport 11 was a smaller, simplified version of the Nieuport 10, designed specifically as a single-seat fighter. Like the "10" the "11" was a sesquiplane, a biplane with a full-sized top wing with two spars, and a lower wing of much narrower chord and a single spar. Interplane struts in the form of a "Vee" joined the upper and lower wings. The sesquiplane layout reduced drag and improved the rate of climb, as well as offering a better view from the cockpit than either biplane or monoplane, while being substantially stronger than contemporary monoplanes. Unfortunately, the narrow lower wing was sometimes subject to aeroelastic flutter at high air speeds, a problem that also manifested itself on the later "vee-strut" Nieuport fighters, as well as the German Albatros D.III. Nieuport 11s were supplied to the French Aéronautique Militaire, the British Royal Naval Air Service, the Imperial Russian Air Service, Belgium, and Italy. 646 Nieuport 11s were produced by the Italian Macchi company under licence, and additional Nieuport 16s were built under licence in Russia by Dux. 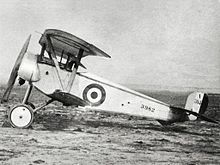 When Romania suffered military setbacks and needed aircraft, several RNAS Nieuport 11s, along with Nieuport 12s were provided. In 1916 an improved version appeared as the Nieuport 16, which was a strengthened Nieuport 11 airframe powered by a 110 hp (92 kW) Le Rhône 9J rotary engine. Visible differences included a larger aperture in front of the "horse shoe" cowling and a headrest for the pilot. Later versions had a fuselage-mounted synchronized Vickers gun, but in this configuration the combined effect of the heavier 9J engine and the Vickers gun compromised maneuverability and made the craft nose-heavy. The Nieuport 16 was an interim type pending the delivery of the slightly larger Nieuport 17 C.1 which was designed for the heavier engine and machine gun with a new, full-perimeter ring cowl, and remedied the 16's balance problems, as well as improving performance. The Nieuport 11 reached the French front in January 1916, and 90 were in service within the month. This small sesquiplane outclassed the Fokker Eindecker in every respect, including speed, climb rate and maneuverability. It featured ailerons for lateral control rather than the Fokker's wing warping, giving lighter, quicker roll response, and its elevator was attached to a conventional tail plane which provided better pitch control as opposed to the all-moving, balanced "Morane type" elevators of the Fokker. The Fokker's sole remaining advantage was its synchronized machine gun, which fired forward through the arc of its propeller. At the time, the Allies lacked a similar system, and the Nieuport 11's Lewis machine gun[note 1] was mounted to fire over the propeller, allowing uninterrupted forward fire. The Lewis was not synchronizable, due to its open bolt firing cycle design which resulted in an unpredictable rate of fire. Clearing gun jams and replacing ammunition drums in flight were challenging though, and the drums limited ammunition supply. This was eventually resolved in French service by the application of the Alkan synchronization gear with a Vickers machine gun to Nieuport fighters starting with some later examples of the Nieuport 16. The British, in the absence of their own satisfactory synchronizer, continued with the overwing Lewis but employed the improved Foster mounting and a new "double" Lewis drum with a capacity of 98 rounds. During the course of the Battle of Verdun in February 1916, the combination of the Nieuport 11s technical advantages and its concentration in dedicated fighter units allowed the French to establish air superiority, forcing radical changes in German tactics. The impact of the Nieuport was so dramatic that in mid to late 1916 several captured examples were repaired, rearmed with a synchronised "Spandau" gun, and flown at the front. One of these was N1324, briefly flown by Kurt Student in August 1916. Others were supplied by Idflieg to a number of manufacturers, requesting copies be built; this had considerable direct and indirect influence on German fighter design. Some Nieuport 11s and 16s were fitted to fire Le Prieur rockets from the struts for attacks on observation balloons and airships. By March 1916 the Bébé was being replaced by the improved Nieuport 17, although Italian-built examples remained in first line service longer, as did Russian examples. Thereafter the Nieuport 11s and 16 continued to be widely used as trainers. Single-seat fighter/scout biplane. Also known as the Nieuport Bébé or Nieuport Scout although these were used for any Nieuport fighter. Variant built under licence in Italy with some detail modifications. Improved version powered by a 110 hp (92 kW) Le Rhone 9J rotary piston engine. The 1st Nieuport 16 was delivered on 16 April 1916. The 25th and last Nieuport 16 was delivered on 6 August 1916.
the Musée de l'Air at le Bourget in Paris has the sole original surviving Nieuport 11, currently marked as N556 with the personal markings of Commandant Charles Tricornot de Rose, holder of the first military pilot licence. It had previously been marked as N976. Old Rhinebeck Aerodrome has had a reproduction Bébé flying in many of their airshows in past years, finished in Victor Chapman's colors, and powered with an original 80 hp Le Rhône 9C rotary engine. 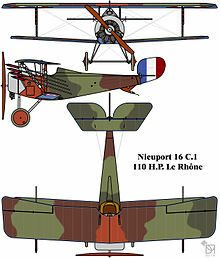 Wikimedia Commons has media related to Nieuport 11. ^ a b c Chant & Taylor 2007, p. 14. ^ a b c d e f Fitzsimons 1967/1969, p. 1989. ^ a b Cheeseman 1960, p. 92. ^ "Old Rhinebeck Aerodrome – World War 1 Aircraft – Nieuport 11". oldrhinebeck.org. Old Rhinebeck Aerodrome. Archived from the original on December 20, 2013. Retrieved December 19, 2013. ^ A few aircraft were at first fitted with Hotchkiss guns and, in Italian service, with the Fiat-Revelli until the Lewis was available in sufficient numbers. Cheesman, E.F., ed. (1964). Fighter aircraft of the 1914–1918 War. Letchwordth: Harleyford. ISBN 978-0816863600. Thetford, Owen (1978). British Naval Aircraft since 1912 (Fourth ed.). London: Putnam. ISBN 0-370-30021-1. This page was last edited on 15 January 2019, at 09:01 (UTC).